Peter Jackson became a household name with the Lord of the Rings trilogy. 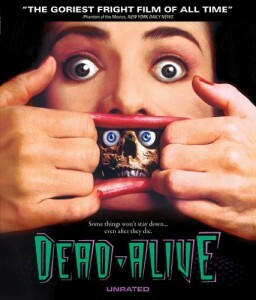 But before he got into large budget sprawling epics he made a few splatter horror films, Dead Alive – or Braindead – being his third feature-length film. The film concerns a man, Lionel, who lives with his domineering mother. While he’s on a date with a woman his mother doesn’t approve of, his mother – who is spying on him – is bitten at the zoo by a Sumatran Rat-Monkey. From the bite she slowly turns into a zombie. But Lionel is a dutiful son, and tries to keep his mother under control by keeping her locked in the house and drugged. Of course, if he kept her separate from the world, this would be a pretty boring movie, so she starts murdering people, who turn into zombies, which Lionel tries to keep locked in the house. It’s an odd reversal on the old zombie movie trope. Rather than people trapped in a house surrounded by the undead, Dead Alive offers up a house full of zombies surrounded by an unsuspecting world. Peter Jackson and his special effects team unleash buckets of buckets of buckets of blood. It’s quite possibly the goriest film I’ve ever seen. “Splatter” doesn’t really begin to describe it. There’s this scene with a lawn mower… wow. The blood and guts is tempered a little with comedy, but if you are the squeamish sort, this movie is definitely not for you. Personally, though, if I have to pick a favorite Peter Jackson film, despite the awesomeness of the Lord of the Rings films and how much I do enjoy King Kong, until The Hobbit movie drops this December, my favorite has to be The Frighteners. There is just something about that movie, I can watch it over and over. Be sure to keep an eye on Final Girl and the rest of SHOCKtober.